What we’ve assembled here are a collection of the most in-demand machines in the Indian market today. And it’s no surprise that they’re all variants on the SUV-theme. Tata Motors appears to be riding this surge in demand for utility vehicles with aplomb – with the Hexa, and now the brand-new Nexon. The Creta continues to set the sales charts alight, but it’ll face far stiffer competition from the Jeep than it could possibly ever have imagined. Every once in a while, an extraordinary personality comes along. This aspect is valid in every walk of life, whether it be in regards to sportsmen and women, world leaders, musicians, actors, and so on. These kinds of people have such strong personas that they overpower their respective field by their sheer presence. This is exactly what Jeep is attempting to do here with the Compass. In an SUV crazed nation, it’s ironic that we don’t really have a proper, usable, and comfortable 4x4 in the twenty-lakh range – until now! So, it seems that Jeep’s all-new Compass is in a league of its own right from the get-go. Or is it? 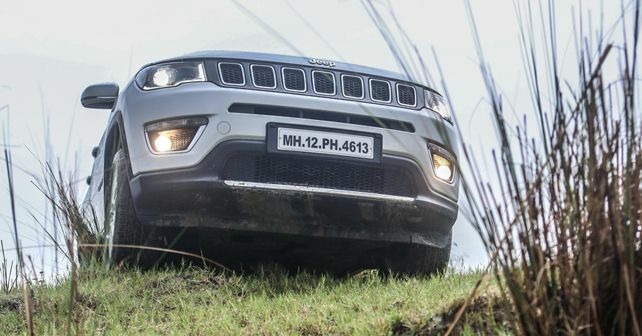 You see, while the Compass comes with the legendary Jeep badge, and despite its bold 4x4 badge, it comes only with a torque-on-demand all-wheel drive system – unlike the bigger Jeeps that feature proper full-time four-wheel drive systems. The Compass, then, like any rising star, needs to prove its mettle here as a proper SUV rather than just looking like one. Fortunately, not only did we manage to find some great off-road terrain, but we also got a lot of slush courtesy of the incessant rain – all of which truly put the Jeep’s off-road credentials to test. And while virtually all the others here were struggling with traction – the Hexa even got stuck on one occasion, since the variant we had on test was the rear-wheel drive automatic variant and not the AWD version – the Jeep, meanwhile, simply dismissed the conditions as child’s play and just kept on going. Head for that dirt trail, then, and the Compass certainly feels like a proper Jeep. Right, now that the elephant in the room has been addressed, let’s get onto the real comparison that we have at hand here. As road testers, we get to see most new cars and bikes in the metal before market launch. Most of the time, we know what to expect and we’re seldom surprised. But the moment I saw the Compass physically for the first time, I actually let out a silent “wow.” I have to say that pictures do not do the Jeep justice. Everything on the car – right from the plastic on the grille to the chrome trim bits, head lamps, and the black roof – is really well finished. 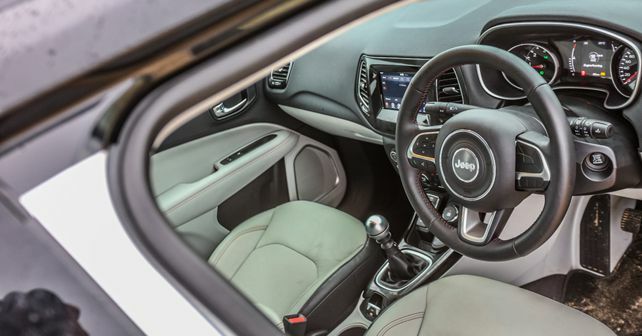 All these small touches make the Compass look upmarket and help it stand out from the crowd. And while you do enjoy the attention it gets, it’s really scary to see bikers turn around to stare at the front of the car as they go by. Yes, it’s that good looking! And I’m happy to report that it’s the same story inside. It feels more like a thirty lakh German luxury car in the cabin. Everything feels very well put together and premium, with leather and soft touch plastics. Don’t forget, this is the top trim – which has an ex-showroom price that’s in excess of Rs.20 lakhs. But, overall, fit-and-finish is the same on all models – and all the switchgear has a nice damped feel to it. The seats are really supportive, both front and rear, and offer very good cushioning. The leather upholstery in this trim feels premium, with the red stitching giving it a nice touch. In fact, the cabin of the Compass feels so high rent that there’s absolutely no car in this price range that has better interiors. At this point, this review is going to appear like a paid advertorial – it’s not – so I’m going to point out some of its weakness too. Sadly, it does have them (I like the car, can you tell?). Well, to start with, the touchscreen interface is not very responsive. Secondly, there are a couple of dead buttons on the steering wheel that look quite tacky. But, most of all – and this could be a real deal breaker for a lot of people – space comes at a premium. You only get 408-litres of boot space, and that’s despite the rear backrest being a little too upright. Fortunately, you do get a full-sized spare. But, the cabin of the Creta, for instance, feels more airy and spacious than the Compass – especially when it comes to headroom. Really, that’s the only flaw in what is otherwise a brilliant package at a great price. This is the first time in India we’ve got Fiat’s 2.0-litre MultiJet II diesel engine. And while there’s a certain amount of engine noise at idle, you don’t really hear the engine beyond that. And with an extremely light clutch and gear lever, the Compass is a breeze to navigate in traffic. Power delivery is nice and linear for the most part. In fact, turbo lag is very well managed – and, in the city, you can drive around without having to go beyond 2,200rpm. Out on the highway, the Compass excels once again with an impeccable ride. And it allows you to carry triple digit speeds around highway bends and dismiss road undulations with equal ease. Push on, and sure the 170bhp motor will run out of steam after 4,500rpm, but it remains a very rewarding car to drive. And while the 6-speed manual transmission is a joy to use, it’s the only transmission you can have with the diesel engine for the moment. In addition, the other nicety that’s missing for the moment is a sunroof. 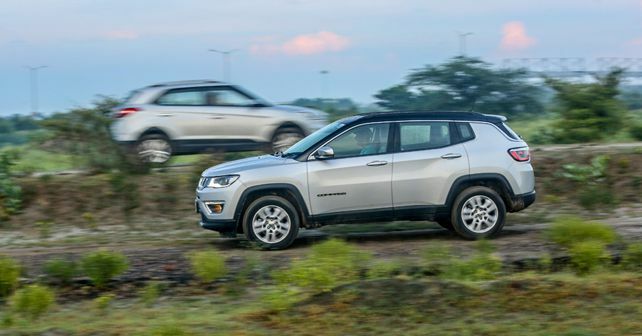 Now, Jeep has really set the cat amongst the pigeons by starting the Compass off well below the Rs.20-lakh mark. So, instead of competing with the Tucson – to which it would lose out on in terms of space – it’s actually more comparable to the Creta, both in terms of space and price. But if it’s space you’re after, neither of these machines really compare with the Tata Hexa. But, while space is plentiful, levels of refinement certainly aren’t on the same level as the Hyundai or the Jeep. Sure, the Hexa has premium touches, and lots of leather, but it just falls that little bit short when it comes to fit-and-finish. 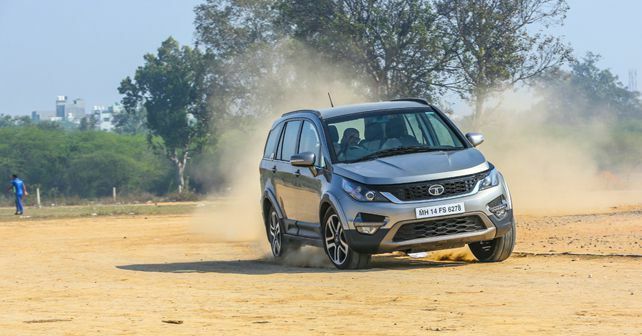 From the outside, it’s a whole different ballgame though – as the Hexa, thanks to its size and aggressive styling, has tremendous amounts of road presence. In fact, because the Hexa is much bigger than the Compass, it commands more attention on the road and people tend to stay out of your way. And that’s a good thing because like most big and tall cars, it isn’t the fastest. The Hexa may come with a 2.2-litre turbo diesel unit, but with 154bhp and an automatic gearbox, this is more of a cruise mobile. While not everyone in the autoX team is a fan of the Hexa, I quite like it for what it is. If you had to equate the Tata and Jeep to man’s best friend, the Compass would be an alert and agile German Shepherd while the Hexa would be a big fluffy Labrador. Yes, it rolls and pitches and isn’t the best handling car here, but it’s clearly designed to be a comfortable family car – don’t forget, it’s the only 7-seater here. It has the biggest boot too, and even with all 7 seats up, there’s still some space for a couple of duffle bags. 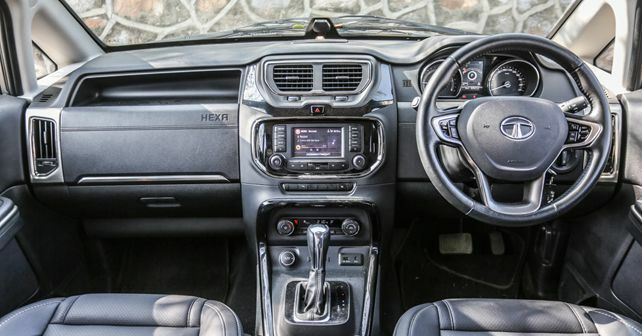 The Hexa also has the most comfortable seats here – with bolster adjust for both front and second row seats. When you consider these factors, the Hexa fares just fine as a comfortable and spacious family car. This automatic model is only rear-wheel drive, but there is a manual all-wheel drive model too. As for the Creta, well, this is the best-selling mid-size SUV in the country by a country mile. And it’s easy to see why – the Creta is just the right size, looks premium, is extremely refined, and comes backed with Hyundai’s quality and after-sales network. Cars from the Hyundai stable have been improving by leaps and bounds with each new generation, and the Creta is the perfect example of where Hyundai finds itself today – the only credible threat to Maruti-Suzuki in the Indian market! The Creta is the perfect illustration of why that is. It hit a sweet spot in the market that even Hyundai couldn’t have imagined before its launch, and it’s sent all the other manufacturers scrambling to develop competing products. The Creta doesn’t pretend to be an off-roader, it’s very clearly a car to make your daily commute an absolute breeze, while providing you and your family with the space and comfort to meet all your needs – virtually 100% of the time. And that’s precisely why this challenge from the Jeep Compass would have caught the folks at Hyundai completely unaware. With pricing that isn’t at that much of a premium, Jeep is attempting to upsell Creta buyers and allure them with the Jeep brand – the great thing for Indian customers is that this promise is backed by a product that is absolutely world class. 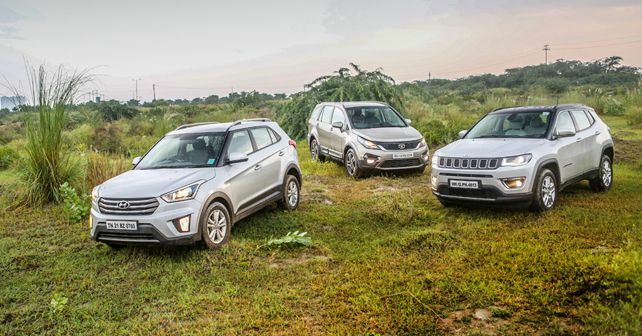 In terms of overall capability, the Jeep trounces both the Hexa and the Creta. The Tata clearly provides road presence, but it’s not as well engineered and won’t be as reliable as the other two cars here. 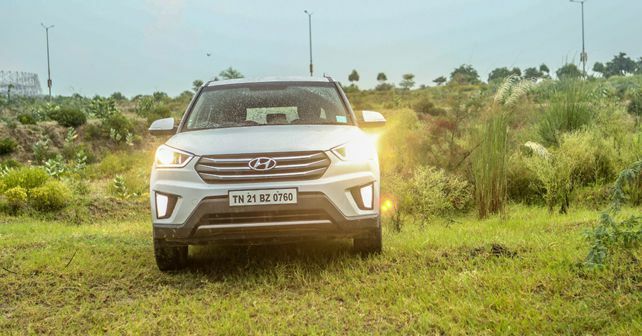 On the sales charts, the Creta will certainly retain its crown – just by virtue of Hyundai’s goodwill in the Indian market and their strong dealer network. And, of course, the Jeep is a fair bit more expensive, but it dangles a very red carrot in front of Hyundai customers – which is sure to make them think twice before signing on the dotted line at their nearest Hyundai dealer. You may have to locate that Jeep dealer on Google Maps, and even head to the next town to take delivery of your Compass – but here’s a product that gives you enough reason to do so. Jeep has laid down the gauntlet – and how! Now let’s see if they can meet customer expectations and match market demand. Neither of those are easy to do – and both of which Hyundai are experts at. X-factor: The most SUV you can buy for the money. And proper Jeep credentials. • Fantastic build quality and fit & finish. • Drives very well – both on and off-road. • Cabin space is at a premium. • Jeep’s negligible dealer network. X-factor: Has a nice heft to it, comfortable, spacious and refined. • Good looks and road presence. • Plenty of space in the cabin. X-factor: Very well equipped, very refined and premium looks. • No four-wheel drive option. • Due for a facelift.